Front photo: This is definitely a BP photo. Paragraphs in wikipedia entry: 41. More if you want to count bullet lists. 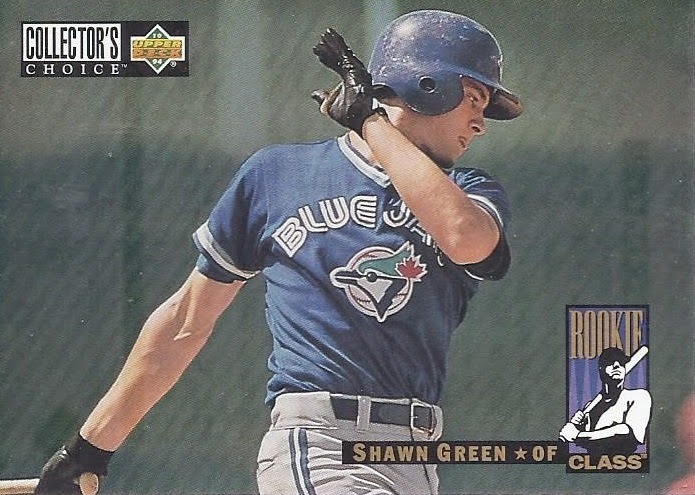 Wiki-facts: Following up Alex Gonzalez, who had a guest appearance on the CBC show The Newsroom, Shawn appeared on episodes of Numb3rs and the Nick Cannon show during his days with the Los Angeles Dodgers. Baseball miscellany: Got a World Series ring for 1993, despite only 3 games and 6 plate appearances. 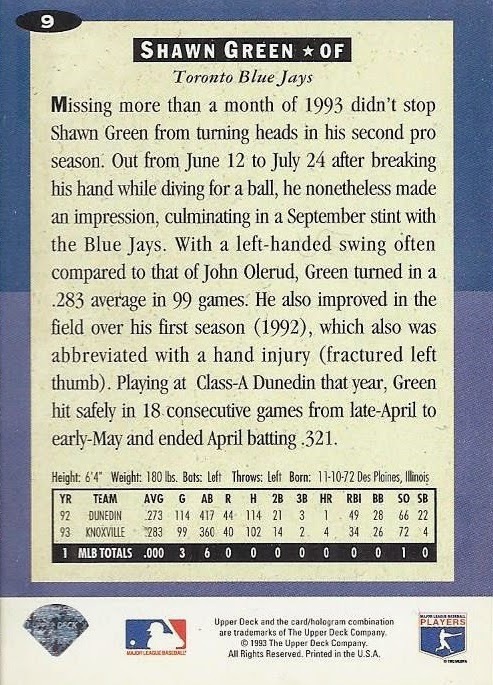 Would get the Topps Rookie trophy on his card, but would have to wait until 1996 for that. Is one of 16 players with 4 home runs in a game, and the second so far in this set, following Carlos Delgado. How was his strike-shortened 1994? : Hit his first RBI over 14 games. Birthday boy: Born November 10, 1972. Shares a birthdate with former big leaguer Greg LaRocca, and former NFLer Isaac Bruce. Bruce was the last Los Angeles Rams alumni to retire. No other people at the various *-reference sites share that birthday. Ties to my Personal Collections: Would play with the Mets as well as Toronto.